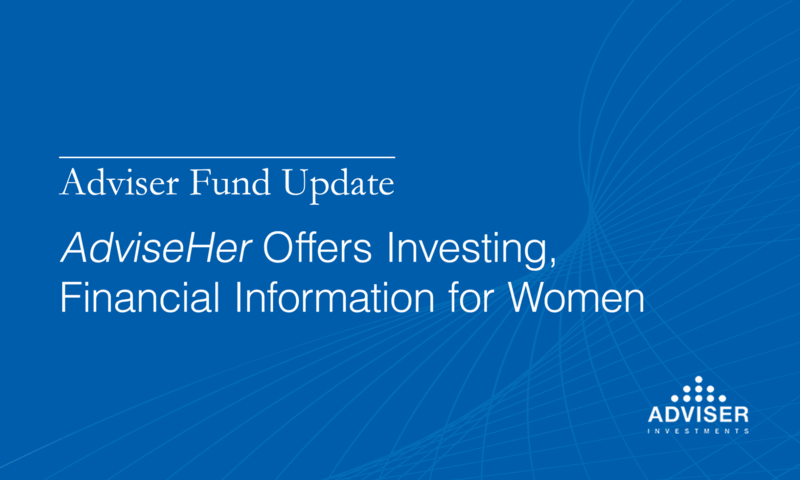 In celebration of Women’s History Month, Adviser Investments is pleased to announce AdviseHer, the first in a quarterly series of The Adviser You Can Talk To Podcast episodes that provide clear information about investing and financial issues that affect women. In this inaugural episode, “Differences in Women’s Investing,” Research Analyst Liz Laprade is joined by Vice President Sue Irwin and Account Manager Diana Linn as they discuss some common themes facing female investors in today’s marketplace, as well as how to overcome these obstacles and specific questions women should ask if they’re looking for help with their portfolio. Upcoming AdviseHer episodes will cover the basics of investing and demystify the world of Wall Street to help listeners understand how investing can help them achieve financial security for themselves and their loved ones. Please click here to listen to “Differences in Women’s Investing” today, and we encourage you to share it with anyone in your life who might find it of interest. And remember, if you’d like to get a notification every time a new episode is released, sign up for a free The Adviser You Can Talk To Podcast subscription. As we first covered in January, Vanguard has decided that a billion dollars just isn’t worth the hassle. Two months ago, the Malvern, Pa. mutual fund giant closed its 32-year-old $960-million Convertible Securities fund to new investors. It also notified shareholders at that time that they should trade into another fund or redeem shares ahead of the liquidation. On March 20, Vanguard shut out the lights and the fund was no longer. Convertible Securities’ dissolution was overseen by its sub-adviser, Oaktree Capital Management. Oaktree continues to manage Vanguard’s Emerging Markets Select Stock and the U.K.-based Global Emerging Markets funds. Vanguard claimed that the closure should not reflect poorly on the fund’s “capable advisor” nor its “prudent approach” to managing convertible securities—hybrid investment vehicles structured like a bond that pay a periodic dividend but can be “converted” into a stock at a predesignated price. Instead, Vanguard did away with the fund due to its lack of popularity among the pension funds, endowments and retirement plans it was designed to serve. As one of its smallest offerings in terms of assets under management, the fund was too small for the $5.1-trillion fund behemoth to continue operating efficiently. The next fund on Vanguard’s chopping block is Morgan Growth, although its issue isn’t size, it’s performance. Morgan Growth is slated to be merged into Vanguard’s U.S. Growth fund, which has a similar objective, on or around April 5. In the last edition, we looked at some early warning signs of cognitive aging that could impact our financial decision-making as we age. This week, we’re turning our attention to some commonly accepted wisdom on keeping the mind active and some specifics on how to put a plan in place to protect your financial assets. Age-related cognitive changes vary by individual, and your genetic makeup counts for a lot in determining whether you’ll stay sharp as you grow older. But while research remains in its early stages, science does point the way to some activities that may help prevent decline. Exercise: Physical activity not only helps fend off a range of health issues later in life, but even a simple daily routine—biking, walking, gardening—increases blood supply to the brain and can keep you cognitively active. Reduce Stress: High stress levels have been shown to impair learning and memory in humans and animals alike. Meditation and other mindfulness techniques, listening to music, even a good belly laugh can help reduce stress hormones. And if there’s a particular task or responsibility in your life that’s causing you stress, don’t be afraid to seek help. At Adviser Investments, we’ve helped many families successfully transition financial responsibility from one generation to the next. Address Cardiovascular Risk Factors: Diabetes, high blood pressure and smoking can be harmful to blood vessels in your brain. Careful management of medications, especially those proven to affect cognition, is crucial to protecting against cognitive aging. Be sure to ask your doctor about any side effects or interactions of the medications you’re on. Some studies suggest that a heart-healthy diet that leans heavily on fruits and vegetables may also be neuroprotective—blueberries, strawberries, broccoli and certain fats, such as olive oil, are thought to help successfully prevent cognitive aging. Engage Your Brain: Anything that keeps your brain engaged and buzzing can help. Think puzzles, reading, using the computer, card games such as bridge, board games with friends and family, or playing a musical instrument. Get Out of the House: Being active in your community engages the brain both socially and intellectually. Studies show that being out and about—or having regular visitors—can promote cognitive health. Getting out to your neighborhood grocery store, library and gym also opens the door to healthier eating, cerebral thinking and physical activity on top of the social element of public interaction. The problem-solving and fish-out-of-water elements of travel can also benefit cognitive ability (so long as travel is not a stressor for you). Embrace the Sandman: Lack of adequate sleep can impair thinking in brains of every age, but particularly when we get older. Discuss any sleep issues you may be experiencing with your physician or other trained professional. This is not an exhaustive list, and we recommend you consult with your primary care physician or other trusted medical providers to come up with a plan that works best for you. As we’ve seen, even absent a degenerative disease, tasks such as balancing a checkbook, identifying suspicious transactions in a credit card statement and making the appropriate investment decisions can become progressively more difficult as we get older. Stay abreast of the latest scams and cybersecurity measures. You can view our helpful infographic with practical cybersecurity tips you can use to protect yourself online by clicking here. The IRS has also provided solid guidance on avoiding and reporting fraudulent activity, and the Federal Trade Commission, AARP and the National Consumers League also offer good information on current common criminal schemes. Make a will. Preparing a will in advance of any normal or advanced cognitive conditions will help deflect potential problems and ensure that your best intentions are carried out. For more detail, we recommend our exclusive Estate Planning Checklist. Keep an eye on your credit. Older adults don’t apply for as much credit as younger people; as a result, they are less likely to check their credit on a regular basis and more likely to be victims of identity theft. Visit AnnualCreditReport.com every 12 months to access free reports from all three credit bureaus. Checking your credit does not negatively impact your credit score and is a good way to uncover trouble spots or suspicious activity before they get out of control. Have your accounts monitored. You can sign up for third-party services that will flag unusual activity in any accounts you link to. Assign trusted contacts to all financial accounts. This allows a financial institution to contact a family member or your chosen agent when it identifies suspicious activity or exploitation. Look into hiring a daily money manager (DMM). DMMs perform some basic financial services—paying bills, tax preparation, balancing checkbooks, decoding medical bills—often for less than you’d need to retain an accountant. You can look for DMMs in your area by contacting the American Association of Daily Money Managers. Consider granting a durable power of attorney, if you anticipate your health might warrant it. A durable power of attorney allows a trusted person (or “agent”) to act on behalf of a “principal” who can no longer make decisions independently. Of course, this is a major responsibility. It should only be granted to someone you trust to act in your best interests. Acknowledging that you or your loved ones need help managing finances can be difficult, we know. But we also know that no one wants a single misstep to undo decades of sound planning. Partnering with a financial adviser who knows you and your finances well can keep you aimed in the right direction and steer you clear of costly mistakes. At Adviser Investments, we have trained our team to identify signs of cognitive aging to protect our clients and their heirs. Please call us if you’d like to learn more for yourself or someone you care about. Adviser Investments operates as an independent, professional wealth management firm with expertise in Fidelity and Vanguard funds, actively managed mutual funds, ETFs, fixed-income investing, tactical strategies and financial planning. Our investment professionals focus on helping individual investors, trusts, foundations and institutions meet their investment goals. Our minimum account size is $350,000. For the sixth consecutive year, Adviser Investments was named to Barron’s list of the top 100 independent financial advisers nationwide and its list of the top advisory firms in Massachusetts in 2019. We have also been recognized on the Financial Times 300 Top Registered Investment Advisers list in 2014, 2015, 2016 and 2018. Planning for Cognitive Aging and Reducing RiskDoes Your Portfolio Need Vanguard’s Commodity Strategy Fund?